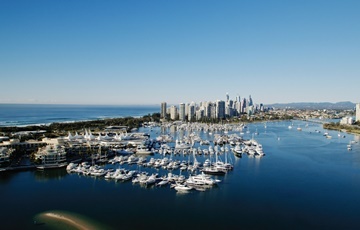 Marinas19 is held in the Queensland boating hub. From the air: Broadwater to Surfers Paradise. The topic of marinas and their key role in servicing and profiting from the emerging boat sharing economy will be addressed by a panel of proven boat share operators. The panel will include John Giglio, president and CEO of Freedom Boat Club (see article p. 22). Future consumer and demographic trends will be the focus of a plenary session by Simon Kuestenmacher - director of research at The Demographics Group, Melbourne. Kuestenmacher is a rising star in data animation and interpretation. He will draw out the implications for the marina industry from the latest trends.